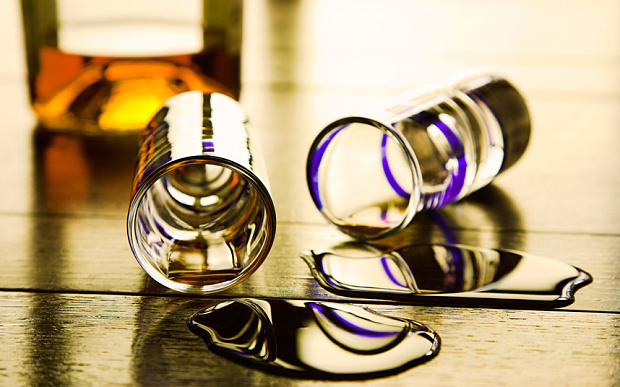 (P1) A bar owner from central France stood trial on Monday for “MANSLAUGHTER through wilful neglect” after one of his customers downed 56 shots of SPIRITS to beat the bar’s record. (P2) The 57-year-old client, named Renaud, consumed the ASTRONOMICAL number of shots last October before his daughter and friends at a bar called “Le Starter” in Clermont-Ferrand. (P3) The previous record of 55 shots in one evening was CHALKED UP on a black board behind the bar. (P4) His record-breaking BID saw Renaud down in the space of one minute 30 shooters – either straight shots or a blend of various spirits with MIXERS. (P5) In all, he consumed around a litre of spirits. (P6) He went into CARDIAC ARREST after being carried home and was rushed to hospital, but died the next day. (P7) On Monday, a French criminal court must rule whether the bar owner bears some responsibility in his PATRON‘s death. (P8) According to the victim’s daughter, the landlord of the bar whispered “only 12 to go” at one point, APPARENTLY encouraging him to keep going. “The owner served the father of my client when he was not in a state to understand what he was doing,” the daughter’s lawyer Antoine Portal told BFM TV. (P9) “It is not known whether he would still be alive if he had not drunk the last 12 shots, but by downing those last shots, he was left with no chance,” he said. (P11) However Renaud Portejoie, the defendant’s lawyer insisted he urged Renaud to stop his record-breaking attempt. (P12) While CONCEDING that chalking up the existing record on a black board was “a mistake”, he argued “no one forced the client to take on the challenge”. (P13) “When you are the owner of a bar and an order has been placed, you cannot always check who is drinking what. We cannot stand behind every customer,” the bar owner’s lawyer told RMC radio. (P15) The trial comes as France is seeking to CLAMP DOWN on BINGE DRINKING, until recently considered a purely “Anglo-Saxon” SCOURGE. In many countries, bartenders can be held legally responsible for serving a customer who is already obviously drunk. Do you think this is fair? The French bar owner was eventually found guilty of manslaughter, but received a “suspended sentence” and will not serve jail time. Was this a just decision? Are “binge drinking” and bad behavior in bars a problem in your country? Breaking many kinds of records can be dangerous. In fact, the Guinness Book of World Records removed certain records in order not to encourage people to try to break them. Do you think it was appropriate to protect people in that way?